Reserve Your own, Choose Your own, or Grow Your Own. Our 12th Season Growing Local Food, Local Jobs, and Food Security. Please read about the different CSA and Marketshare options before signing up. Print out the signup sheet, fill it 0ut, and mail it in with your check. We can take credit card payments with an additional 3% transaction fee, send me an email (address below) or pay at a market or CSA fair. Summer Vegetable CSA: Reserve your in-season vegetables all season long. NEW, shorter, more affordable Veggie Shares. 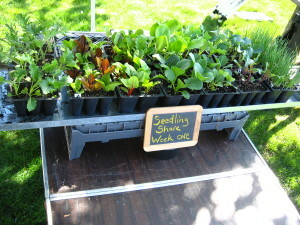 The farm grows a HUGE variety of vegetables and herbs for the CSA, and what is in your share evolves with each season. Less produce is available in the spring when the farm is just starting to produce. Shareholders pay up front, and provide the farm’s operating budget for the season. Shares cost $400.00 and must be paid in full no later than May 15. Half Shares cost $250.00. 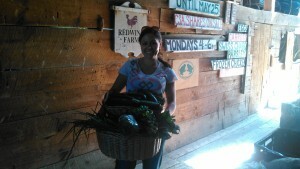 Vegetable Shares are picked up at the farm: 288 Upper Cross Rd. in Lebanon, Maine from 4:-7:00 pm each Monday during the 15 week season (June to September; rain, shine, or holiday). Shares are designed to feed the typical family of four that cooks most meals at home, or two adult vegetarians (lists of past years’ distributions are on our BLOG.) What’s in a share varies, and depends on the growing season: This list varies every year depending on season. Spring: salad mix, kale, arugula, beet greens, radishes, bok choy, scallions, baby beets, baby turnips. Summer: peas, beans, beets, Asian greens, broccoli, cabbage, carrots, onions, summer squash, zucchinis, cucumbers, tomatoes,potatoes, garlic scapes, sweet corn, peppers, parsley, basil, and Swiss chard. Fall: sweet potatoes, winter squashes, turnips, parsnips, spinach, Jerusalem artichokes, pumpkins, garlic, onions, and some winter storage crops. This is an easy, low commitment option! For each $100.00 marketshare purchased before May 01, get $120.00 worth of any of our products at any of our markets. This option is great for those who want to support local agriculture, save money at market, want to choose their own veggies as needed, and want to shop at different markets. This option is also great for churches, food pantries, or other organizations that want to purchase local, organic food for other community members in need. Take the guesswork out of what and when to plant with five pickups starting early May, and ending late June. You get over 400 organically grown seedlings (more than 40 varieties of 22 different herbs and veggies) along with expert advice on organic garden prep, planting, pest/disease/weed control, and harvest. These are the varieties and methods that we have used on our farm for the last 9 seasons. Seedlings are distributed at peak health and readiness and at the right time of season, giving your crops a head start on success. You need 25’x25′ of garden space (625 square feet, or 125 feet of 3′ wide garden bed) to accommodate the seedlings. Pickups are every other Saturday afternoon from 4:-6:00 pm. The list of seedling types is below in FAQ’s. If you have questions, be sure to see our FAQ’s page. 207 252 1103 or email at: TwoToadFarmer [at] gmail [.] com.